Run 3 is the latest episode of the Run series, a series of online games that addicted hundreds of thousands of players all over the world. The goal of this 3rd installment is similar to it’s previous versions forcing you to survive as long as possible inside the space tunnel by beating the challenges of each level. Talking about the actual challenge, one needs to complete a stage by constantly choosing the safest path to run onto, as large gaps in tiles will appear in front of your character on all sides of the tunnel. 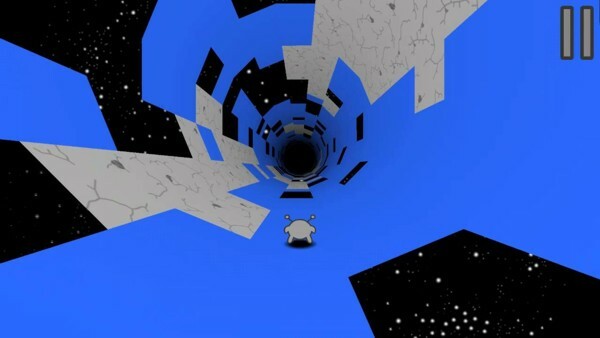 Once you decide to switch to another side of the tunnel in order to avoid death the stage will also rotate itself in the needed direction and the gravity will change in order to keep you hooked to the ground. At some point the gaps will increase in size and the tile planks you step onto will come lose so you will need to jump in order to avoid falling into the space abyss. Just like in it’s previous versions Run 3 start menu and graphics couldn’t be more simple and bland, yet the game addiction doesn’t rise from the graphics or any other hi tech aspects that one would expect from a game that managed to get viral online, no Run 3 will get you by it’s simplistic, kind of annoying and frustrating action that will make restart over and over again in order to try and beat your score and advance further. The tasks are challenging, yet not impossible to beat, but in order to succeed you sure need to spend some time hooked to your laptop or tablet, running, jumping and collecting the tricky coins set. If you manage to progress a bit you will unlock new characters and new game modes to try, yet the action remains the same. The hard earned coins can be used to buy upgrades or new characters and also to pay for restarts as you have only one life per game and once you die, it’s all over. Each of the new unlocked character has it’s own set of abilities that will make your job easier while playing that really adds to thrill and excitement of the game. Overall the game is really nice to play and Run 3 also comes with a built in leaderboard so that you can share your score and compare it among the others thus keeping you hooked to it even more.